By Peter Anderson 10 Comments - The content of this website often contains affiliate links and I may be compensated if you buy through those links (at no cost to you!). Learn more about how we make money. Last edited August 4, 2012 . 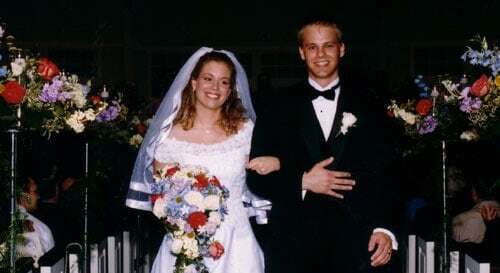 Today is the tenth anniversary of the day that my wife and I were married. I remember the day well. I was living with several friends at the time, and we all slept in that morning before getting up and heading out for a mid-morning breakfast at Denny's. The day started out extremely stormy, and at one point the skies turned green – the type of skies you expect to see when a tornado is heading your way. Despite the downpours and high wind we had a pretty casual morning and we made our way to the church by the lunch hour for photos. Our photos were going to be in a local park, but the rains moved us into the church. I remember talking to my wife later on about how different her morning was the day of our wedding. The ladies were up at the crack of dawn and heading in for hair appointments, last minute dress preparations, and more. They were scrambling around trying to get everything done while the guys showed up, got dressed and played a little frisbee. Finally we all had our pictures taken together, and then came the ceremony. Now fast forward ten short years, and here we are celebrating our 10th anniversary! How did the years go so fast? Today I decided to share some things that I've learned in those 10 years, and talk about some things I'm thankful for about my wonderful wife Maria. I think I've learned a lot of things about marriage in the past 10 years, some the hard way. Here are a few of them. It's important to listen: As a husband, sometimes it's best to just listen to your wife and beat back the urge to try and fix things all the time. During our first year of marriage especially I found myself talking with my wife about her problems, and always trying to fix the problems. Thething was my wife only wanted me to listen, and share her feelings with me. Try to put your spouse first: In our culture we're constantly bombarded with the importance of the individual, and of doing what's right for ourselves. In marriage, however, it's important to have the other person's best interest at heart first, otherwise it will lead to hurt. Be careful what you say, words wound: In our 10 years of marriage we've had our share of ups and downs, and we've both said things that we regretted. Be careful what you say to your significant other because words can sometimes hurt worse than physical pain. It's important to forgive: Since we've had those ups and downs we've also had plenty of occasion to forgive each other. Be ready and willing to forgive, even if your partner is still upset. Communicate: You would think since I write hundreds of words 5 days a week that I'd be better at communicating, but verbal communication seems to be a weak point for me at times. I've learned the importance, however, of communicating with your spouse, and always being open and honest with them. Make date night a priority: It's important for you and your spouse to connect with each other on a regular basis, especially after you have kids. It's tough to find the time, but it really is important. Be generous with your spouse: Be generous with your wife or husband in all ways. In love, in forgiveness, in hugs and kisses. Nice gifts don't hurt either. These are just a few of the things that I've learned, and I'll be the first to admit that far too often I've learned them the hard way. I can be hard headed at times, but I know I'm lucky to have married such a wonderful woman. There are a myriad of reasons why I'm thankful for my wife Maria. The depth of her love: She's so much more loving than I could ever be, when she care for you, you know it. I've appreciated that even more-so now that we've had a son, and I've seen the depth of her love and caring for him as well. She's a wonderful mother: She is a wonderful mother, loving and caring, and sympathetic when I can't work up the will to care. She's fiercely loyal: If she's on your side she'll be there for life. I know my wife loves me no matter what. She's a fighter and a survivor: She's gone through a lot of health issues in the past few years from a massive blood clot that could have killed her, to a couple of surgeries. She's a fighter and a survivor and got through them all! Her sense of humor: She's got a wonderful sense of humor, and her laugh will always make me smile. She's beautiful inside and out: She is gorgeous, and her smile lights up the room. Not only that but she's beautiful on the inside as well. I feel extremely blessed to have married this wonderful woman, and I thank God for her every day. It's been ten short years since we joined our hopes, our fears. together as one, loving God's Son. In good times and bad, whether happy or sad. We've known the utter depths of sorrow and despair. but through it all we remained in love, and forever there. I grow to love you more each day, and more than words can say. I know we'll weather every storm, and forever be as one. Maria I'm forever yours, your love. Last Edited: 4th August 2012 The content of biblemoneymatters.com is for general information purposes only and does not constitute professional advice. Visitors to biblemoneymatters.com should not act upon the content or information without first seeking appropriate professional advice. In accordance with the latest FTC guidelines, we declare that we have a financial relationship with every company mentioned on this site. Congrats on the ten years! I know every day my love for my husband grows more and more. He always surprises me! I can’t wait until our ten year anniversary. It will be one in August! Our fights are all due to miscommunication. Communication is key, because everyone perceives things differently. Congrats on 10 Years. My wife and I celebrate 5 on Saturday. Congratulations on 10 years of marriage, Peter! I’m still on my first and am finding your advice SO true! Love, Communicate, Forgive, Listen, and yes, schedule regular date nights. We have ours once a week. May God richly bless you with many more years together! Peter, congratulations on your 10th Anniversery. Your advise is very valuable. You are wise beyond your years. I am going to soon turn 52 years old and celebrate 24 years of marriage this year and I feel like I learn so much from you every day. What a godly man, what a great husband and father, what an inspiration and blessing to those of us who follow your blog. The very best, my friend. What a beautiful post! Congrats on reaching ten years! 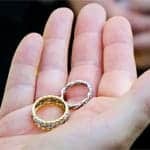 I’m newly engaged and I think these tips will be very helpful to my fiance and I as we move forward in planning our future together. Thank you honey for such a beautiful post on such a special day for both of us. I love you more than words could express! Happy Anniversary honey! What a great tribute to your wife Peter. Happy 10th! Congrats on your tenth anniversary! Congrats on 10 wonderful years. A very moving and touching post. thank you for sharing with us. Today I have re learned things that I have forgotten, and I will put them to good use. “Husbands, love your wives, just as Christ loved the church and gave himself up for her”. You can make all the right investment choices, reduce debts, save money, and follow the rest of the money related topics discussed on your site. If your marriage fails, what is left? Divide your assets in half, and double your living expenses. Building a strong Biblical foundation for a marriage relationship may be the most important money principle. Nice words. Next Post: What Is A Health Care Flexible Spending Account (FSA)? How Does It Work?